Once in a while, in the never ending and challenging quest of finding value wines, one does get rewarded. Though with the current trend of rising prices, sadly it happens all too seldom. I have to explain that for me, in most cases, good value means that I can get exceptional quality, mind-blowing, profound etc. wine with still reasonable price, instead of getting decent, or ok wine super-duper cheap.. well you get the point. So here is a wine that is one of the best values I`ve come across in a long long time. Ok, I was kind of expecting some kind of value here, as Guido Porros wines have never disappointed, but this one exceeded my expectations. Almost just too delicious to analyze..
Gorgeous wine, great combination of traditional style, high drinkability and a lazer beam intensity of fruit. Aromas of leather, raspberries, strawberries, sour cherries, forest floor, moss, smoke, liquorice; a misty morning in an autumny forest.. Wow, very complex. 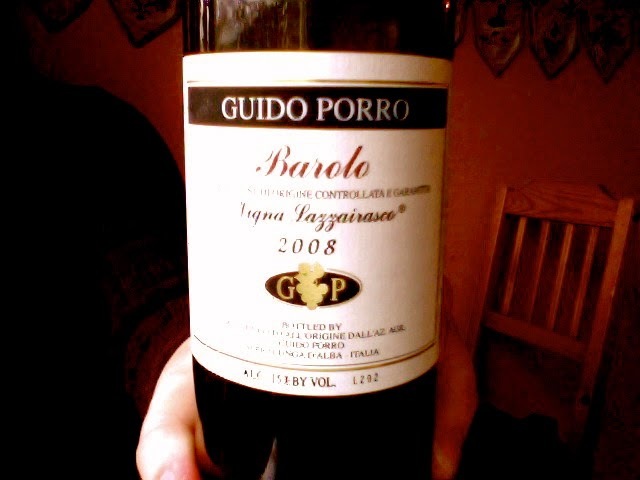 Surprisingly full bodied and fruity, though traditional, feels almost New World in it`s style(but only in a good way). A raspberry galore at it`s best, with sour cherries, hint of strawberries, liquorice, violets, tar, leather in the mix. Also quite savory, but at the same time fruity and even sweetish. Has a very long and haunting aftertaste. The raw intensity of the fruit (which is not fake, but really pure and fresh) is intriguing, and the straightforward deliciousness and balance for an young Barolo; and yet, tannins are there with a good amount of acidity, so this has many years to develop, and become scary good..
Just a perfect wine for me today, in the year of our lord 2015.